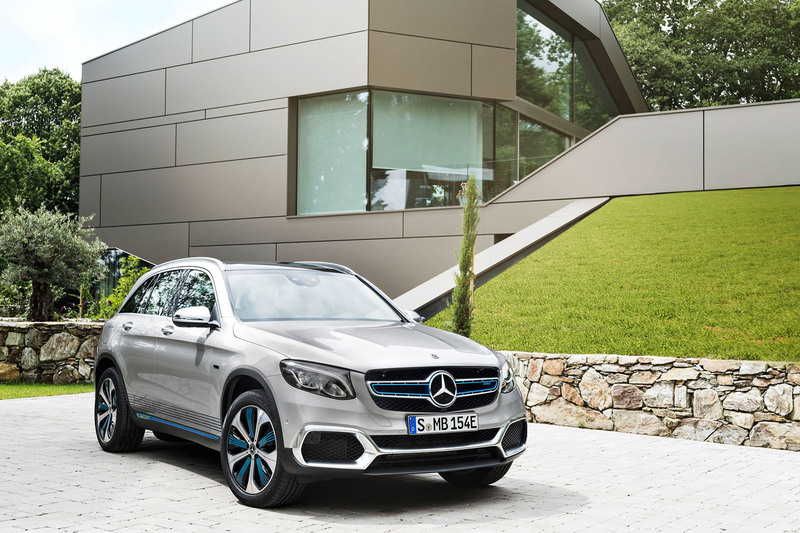 The new Mercedes-Benz GLC F-Cell is the first road car envisaged for series production to combine both a hydrogen fuel cell and a plug-in battery. Unveiled at the at the Frankfurt motor show prior to a planned start to sales through commercial channels in selected markets in 2018, the GLC F-Cell is capable of delivering a claimed driving range of 272 miles on the European test cycle. Some 30 miles of that distance can be achieved on the electrical energy provided by its battery alone, according to Mercedes-Benz. The dual power source allows the GLC F-Cell to run on either hydrogen via a fuel cell stack, mounted in the space traditionally taken up by the GLC’s combustion engine up front in the nose, or on mains electricity stored in a battery and recharged via a socket at the rear. In hydrogen mode, the new model’s polymer electrolyte fuel cell stack converts hydrogen to electricity to power an electric motor developing 197bhp and 258lb ft. Integrated within the rear axle assembly, the fuel cell's motor channels drive to exclusively to the rear wheels via a fixed-ratio gearbox. The hydrogen is stored in two carbonfibre tanks at a pressure of 700bar; one tank is housed within the centre tunnel and the other underneath the rear seat. Together, they can hold 4.4kg of hydrogen. 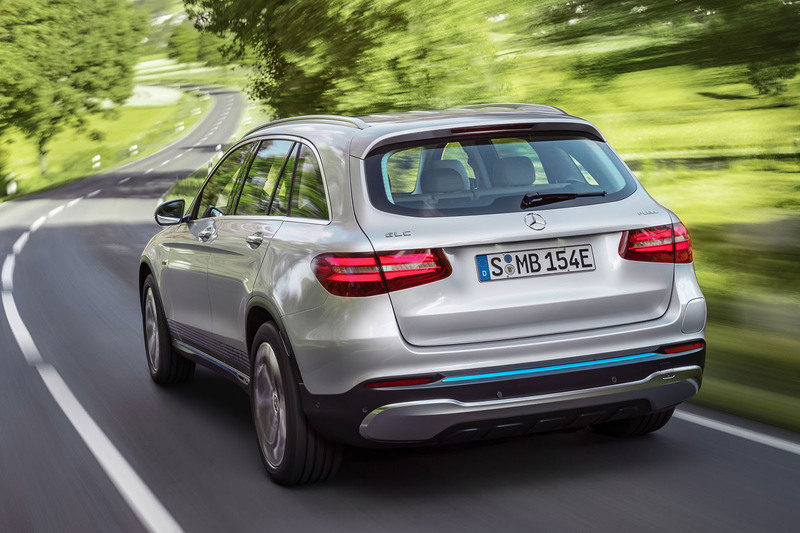 In electric mode, the GLC F-Cell draws energy from a 13.8kWh lithium ion battery sited underneath the luggage compartment at the rear to power its electric motor. Electrical energy for the battery can be sourced either via plug-in means or from the fuel cell stack whilst on the move. Mercedes-Benz claims the only compromises in packaging over the standard GLC is a slightly higher luggage compartment floor (in line with that of the GLC350e 4Matic plug-in hybrid) and a higher-set rear seat, due to the positioning of the larger of the two hydrogen tanks. The GLC F-Cell offers the choice of four operating modes: Hybrid, in which it draws power from both the fuel cell and battery; F-Cell, where the state of charge of the battery is kept constant by electrical energy created by the car’s fuel cell stack; Battery, which sees power drawn exclusively from the battery without the operation fuel cell stack and Charge, where electrical energy from the fuel cell stack is used to top up the energy stores of the battery. An energy recuperation function stores kinetic energy created during braking or coasting in the battery to maximize the range in all modes. There are also three driving modes: Eco, Comfort and Sport. While the operating modes influence the interplay between the fuel cell stack and the lithium-ion battery, the driving modes alter the behavior of the steering, throttle and suspension. Mercedes-Benz is yet to quote a kerb weight or any performance figures for the GLC F-Cell, saying only that it has been conceived to offer a top speed of 100mph. The pre-production GLC F-Cell on display in Frankfurt is visually differentiated from more conventional GLC models by subtle styling changes. Included is a re-styled front bumper with prominent chrome look surrounds to the outer front air ducts and a splitter element set low within the leading edge. There’s also a reworked grille with blue accents – an identifying touch that is mirrored within the new model’s aerodynamic optimised 20in wheels, revised side sills and re-profiled rear bumper. They are combined with 'EQ' identification of Mercedes-Benz’s new electric car sub-brand within the front fenders. 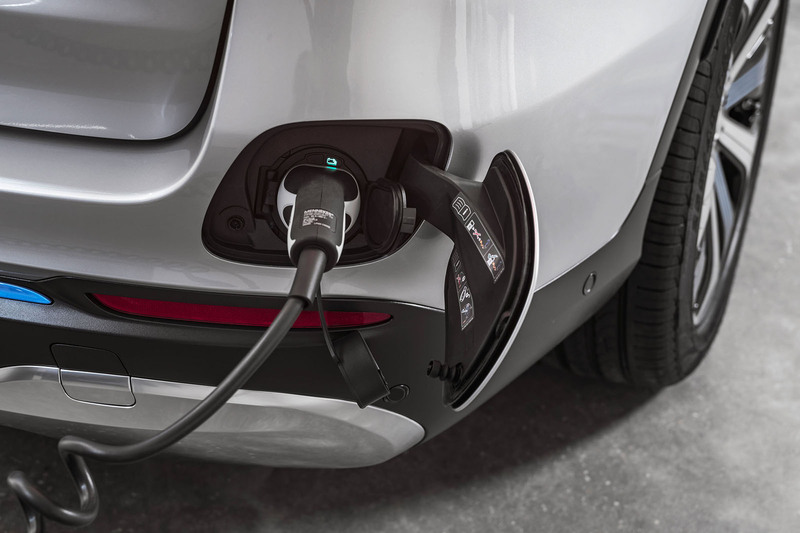 The hydrogen re-filling nozzle is located underneath the fuel filling flap, while the charging plug for the battery is integrated within the right-hand side of the rear bumper. Inside, the new five-seater builds on the standard GLC with a new 12.3in digital instrument cluster, new wool-and-linen-based upholstery, the choice of either black lacquer or open pore wood trims and a newly developed touchpad with handwriting recognition integrated within the centre console. 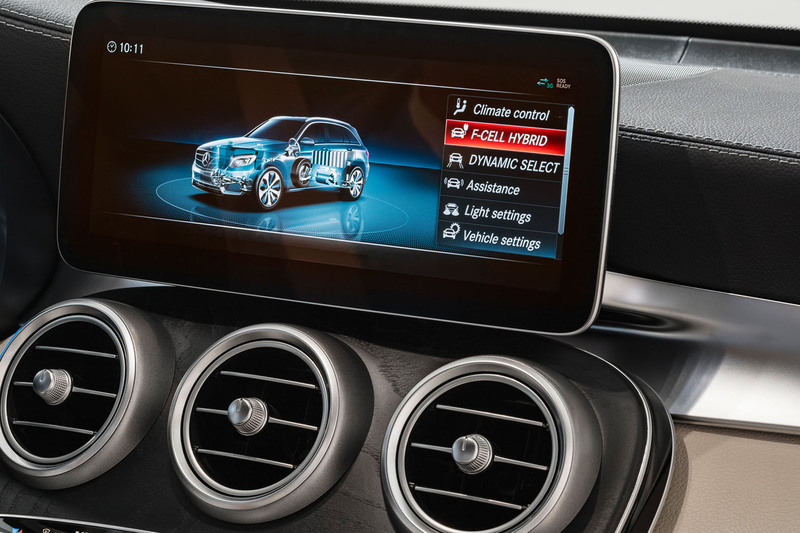 Among the standard equipment for the GLC F-Cell is climate control air conditioning with remote pre-entry operation, as well as heated seats and mirrors. Mercedes-Benz is yet to confirm exact details of how it will sell the GLC F-Cell, although officials confirm market-specific sales concepts, including a rental model, are being evaluated. As with more conventional combustion engine and petrol-electric hybrid versions of the GLC, the new model is planned to be assembled at Mercedes-Benz’s Bremen plant in Germany. Both left- and right-hand drive versions are planned. The GLC F-Cell is the culmination of over 24 years of fuel cell research by Mercedes-Benz, which unveiled its first fuel cell research vehicle, the van-based NECAR 1, in 1994. It was the first of five roadgoing NECAR concepts, which lead to the development of the B-class F-Cell used by the German car maker in an around-the-world publicity campaign aimed at showcasing the long-distance potential of hydrogen fuel cell vehicles. To come up with a subsidized £80,000+ car that just reaches 100mph, has limited boot space, like the ix35 will get 20'ish mpg, expensive to service, won't go on general sale, won't be produced in numbers, heavy, slow, uses inefficient fuel source. Having said that a plug-in is hydrogen's only chance, although how many garages will sell hydrogen knowing people will use the battery first and hydrogen as a backup only.